Dwell by Cheryl: "Winter Wonderland $13 Tablescape"
Mission accomplished! As I mentioned in this post, I'd been wanting these First Frost plates from Target for years. Mrs. Claus was able to find them at a discount retailer at home for a great price. Instead of packing them away until next year, I decided to use them through the winter. Why not? 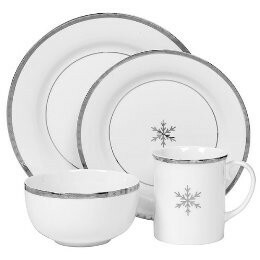 The snowflake design certainly makes them versatile enough to go beyond the Christmas holidays. I picked these small metallic flower pots up at Goodwill (where else?) for $0.99 each. I wasn't sure what I was going to do with them but for $3.00, I figured I'd find something. I did. On a late night trip to Lowe's, I scored these metallic pine cones for $2.00 a box, and a scheme was born. I picked up two boxes of the pine cones, (even though I only needed the silver ones, I figured one can always use gold pine cones), some Spanish Moss and some clearance Christmas cactus. Succulents are big right now and the cactus has that same look. The addition of some "frosted' garland that I already had and a fabric remnant runner and, "Viola!" It has the winter wonderland vibe I was going for, don't you think? I'll probably keep it through January at least. I'd say it was $13 well spent. Dinner party anyone? Happy Monday! P.S. Can you tell I used my new camera? That's beautiful Cheryl. I'd think you could keep it out at least til end of Feb. Just before Spring. Beautiful table! I love seeing your creations! Love it!!! We converted our Christmas outdoor decorations to winter ones -- left out the deer and snowmen! Love the camera -- again! Looks great and the pictures look wonderful! Cheryl, you are a genius! I just discovered your site and LOVE, LOVE what you have done - frugal shopping that looks expensive! Thank you for inspiring me for my Christmas dinner table this year!